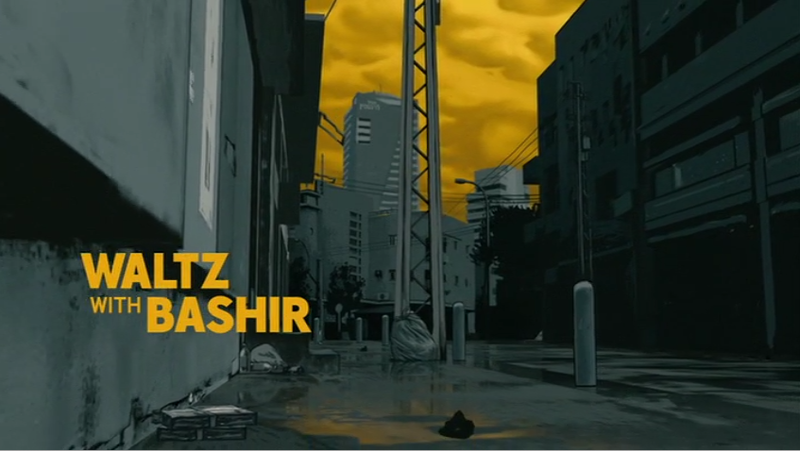 Ari Folman’s masterpiece Waltz with Bashir is a film that blends a number of genres together. Despite being in the documentary genre, the film itself is a blend of reality, imagination, and hallucinations. 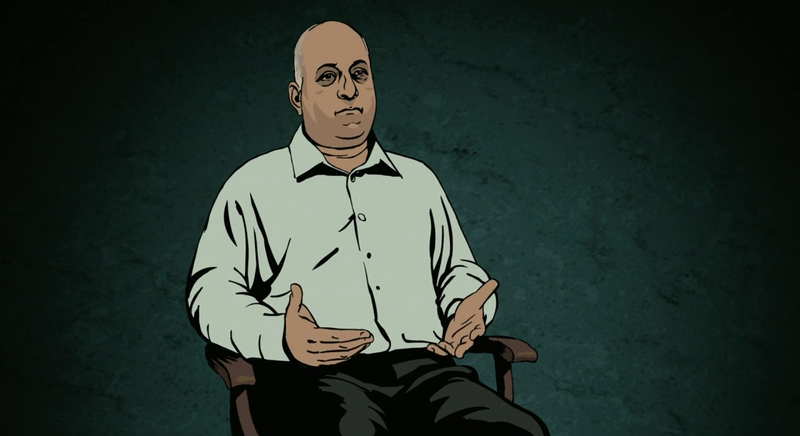 This leads to the question: What is Folman’s animated, fictionalized, docu-autobiography? Its ability to capture so many elements from being a war memoir, to a piece of investigative journalism, to being an artistic creation constructed for self-therapy provides the film life. Its ability to move between dimensions and emotions makes it a film that is both compelling to watch and worth comprehending. Perhaps one of the most important concepts of the film is the transcendence of reality. From the very first shot, the viewer is exposed to a number of elements that question dimensional reality. 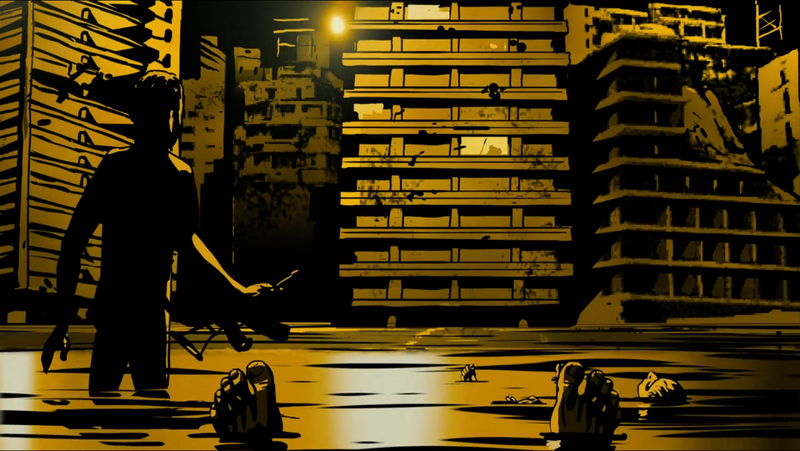 The element of animation immediately forces the viewer to reestablish the films genre and credibility. The high contrast between the yellow-orange sky and dark façade of the building creates an illusionary scene. Coupled with the sparsely populated streets the scene becomes incredibly imaginary. The introduction of the wild dogs that seemingly have authority over the law and its citizens undoubtedly marks a level of fiction that becomes undisputable. 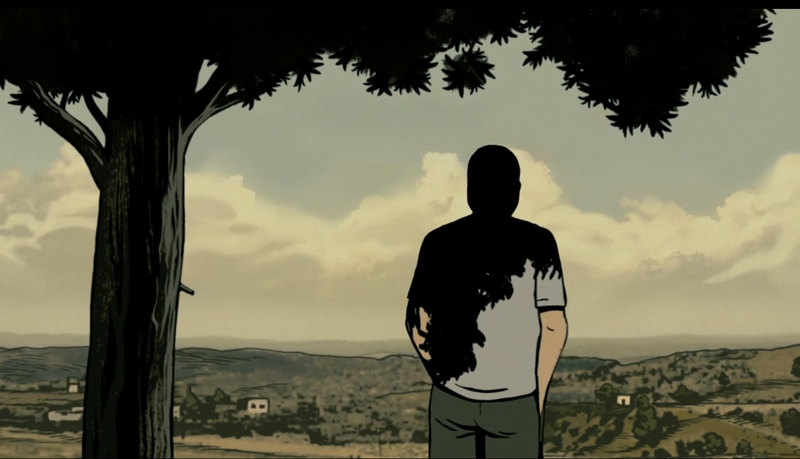 When the scene ends it is revealed that the scene was an abstraction of reality: it was a dream recounted by Lebanese fighter to Ari Folman. The first scene pioneers the continuous confusion between reality and imagination within the film. 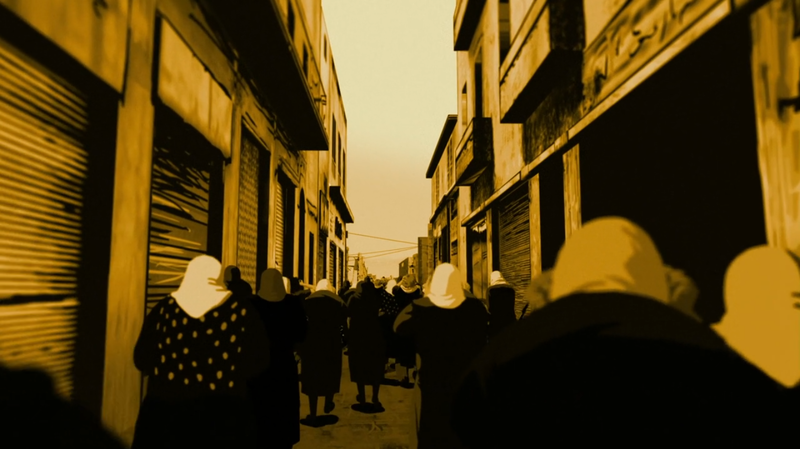 Immediately following Ari Folman’s meeting with his comrade who explains his dream, Folman informs the audience through a voice over that he experiences a flashback to the war in Beirut, Lebanon during the massacre that occurred in the Shatila refuge camps. As he does the voice over, the camera does a slight whip pan into his flashback. 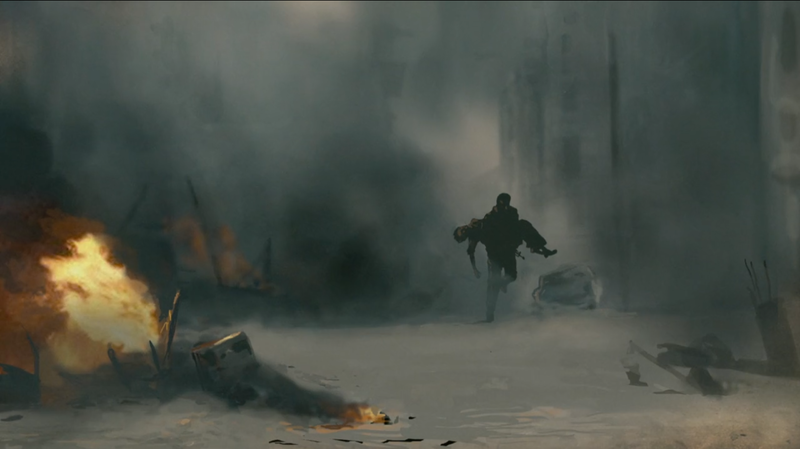 When the shot cuts, the new shot is an exposition shot that clearly displays the backdrop of a city in ruin. 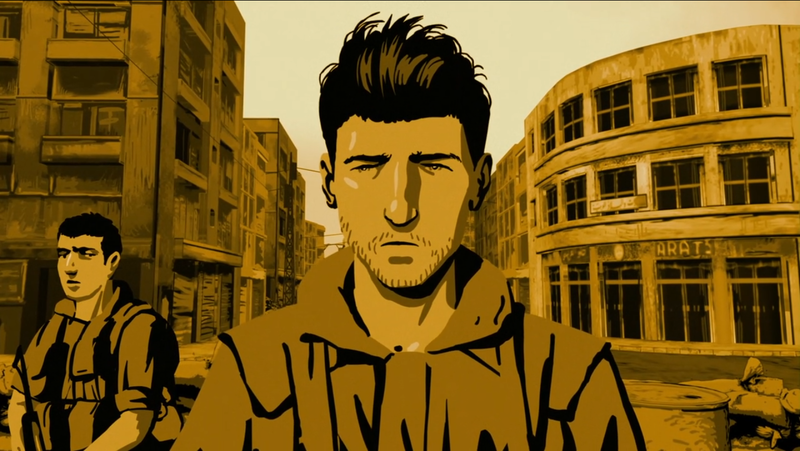 The exposition shot mirrors the dream of the Lebanese fighter with high contrast of color and a yellow-orange sky. The subsequent shot shows a much younger Folman with much less facial hair bathing in the Mediterranean. Following the shot of Folman is a point of view downward tilt focusing on the fall of a flare. 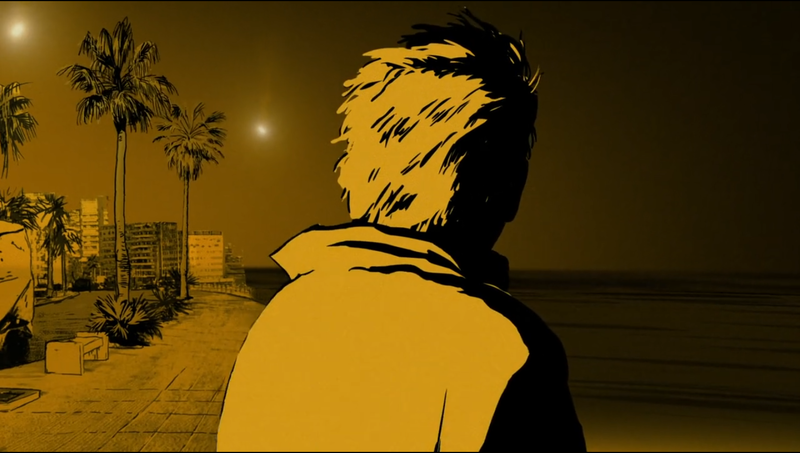 The flare itself becomes an important symbol and theme that is revised later in the film. As the scene progresses, a deep shot of Folman and his two comrades climb the stairs leading into the city creating a transition in mise-en-scene. The backdrop of the city changes from the surreal orange into a more realistic low exposure shot. This transition makes the audience feel as if they are transitioning back to reality. This eventually leads up to the critical shot in this scene, which is a tracking shot of Folman as he turns a corner and is presented with a mass of silent women and children streaking by him. The camera then rotates by tracking from behind Folman to a close up of his face. This critical shot ends with the reaction of Folman and it effectively ends the flashback scene. The cut is accompanied by the end of non-diegetic music making it explicitly clear that the scene is effectively over. The very next shot creates a transition back into reality as exposure is back to normal and the audience immediately hears a diegetic sound of Folman ringing a doorbell. 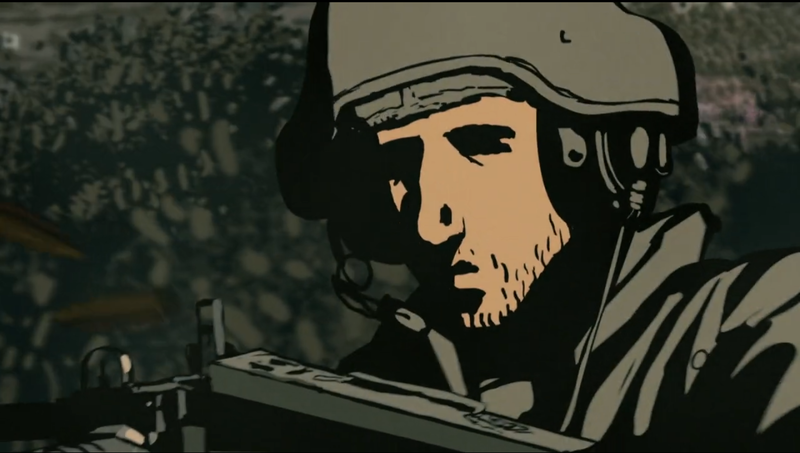 In the subsequent scene, Folman explains that he is unable to recount the war and his flashback was not an accurate memory, but an “image”. It is not an account of reality to Folman, and this drives him to find the truth of his past. To discover his own memories Folman seeks the memories of his comrades from the war. By piecing together the memories of his friends, he is able to piece together the pieces of the memory suppressed in his mind. What becomes apparent is that collecting memories from others is no easy task. War is never easy on the human psyche and its grotesque form breeds fear and bends reality. The idea that war distorts reality becomes exceptionally clear when Folman and Carmi (Folman’s friend from Holland) watch Carmi’s son pretend to shoot a gun. The long take begins with Folman and Carmi looking over to Carmi’s son, at which point non-diegetic music begins to play and the camera does a pan and begins tracking Carmi’s son. The camera follows Carmi’s son as he runs and pretends to shoot a machine gun. 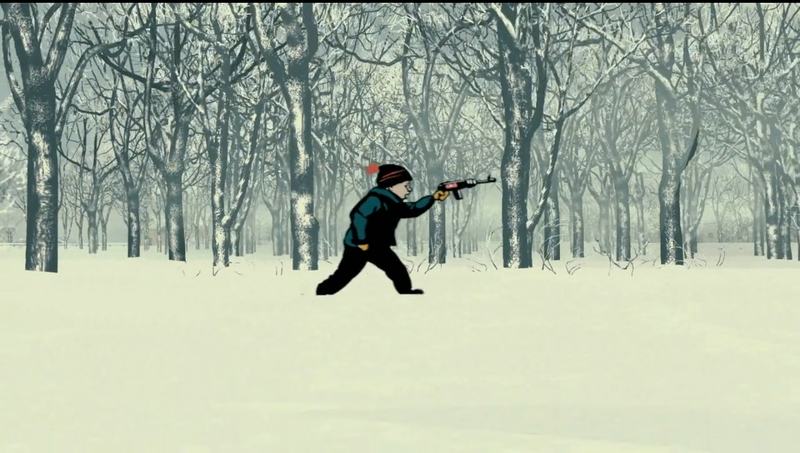 As he shoots his gun, non-diegetic gun sounds are synched with his motion of firing the rifle. The camera then tracks backwards into the sky, behind the clouds and into a different reality as the camera tracks and zooms into a boat. The boat is introduced as a vessel that Carmi is aboard during the war. The shot ends with a medium close up shot of Carmi seasick. 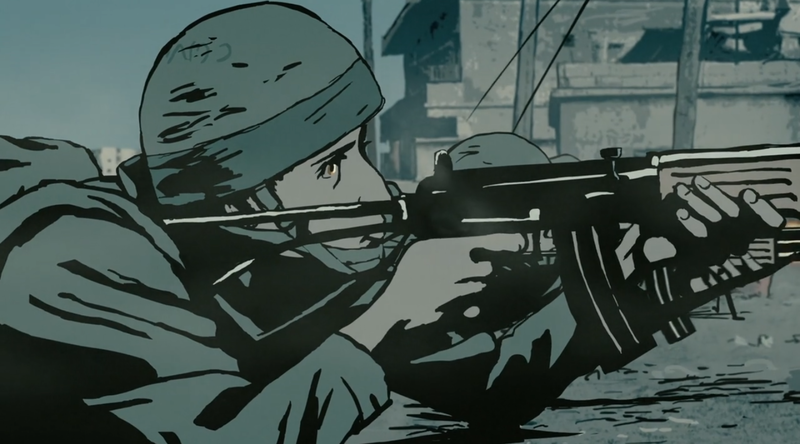 The long take is important in establishing the concept that war distorts reality by combining the actions of a boy pretending to fight and a certain memory of a war. The long continuous take alludes to the idea that neither image depicted is truly credible or real. This is further supported by Carmi’s hallucinations of a giant woman “taking him” as he watched his brothers burn. 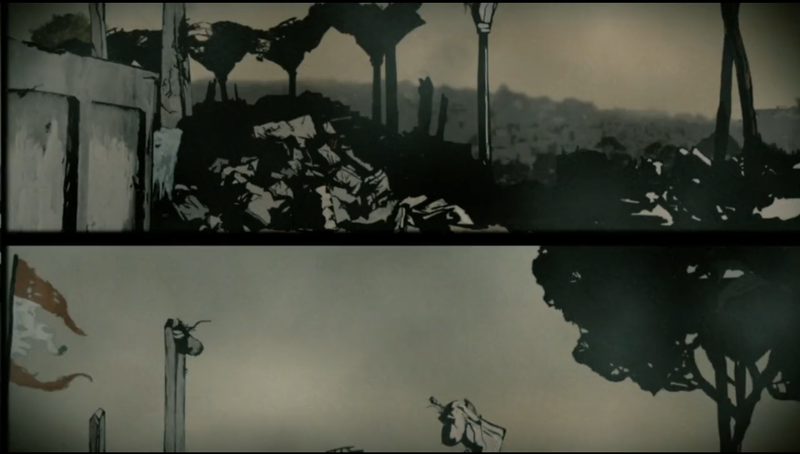 When Folman consults Professor Zahava Solomon on trauma-induced amnesia, she describes the psychological complex to be when “someone who experiences a situation, yet they perceive themselves to be outside of it.” She goes on to explain how a photographer survived the horrors of the war “by pretending to view everything through an imaginary camera.” At this point, the scene cuts to still images of the photographer’s photographs accompanied with a haunting non-diegetic soundtrack. These photographs have similar light exposure and contrast with the memories of Folman’s comrades. This implies that Folman and his comrades all disconnected themselves to the war to survive its horrors. As Solomon informs the viewer “when the camera broke, [the photographer] stopped seeing the situation as fantastic and it became traumatic for him” the last still image of a city in ruins begins to take the form of a film projection stabilizing. This is a clear demarcation point between a psychological detachment and reality. 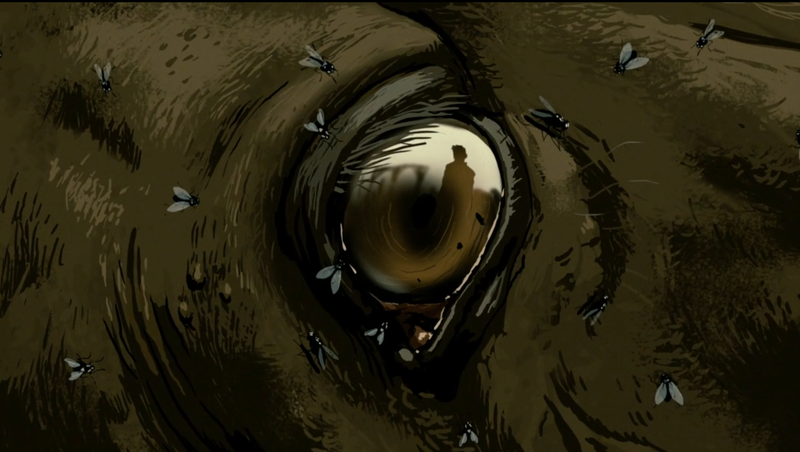 The last shot of the scene is an extreme close up of a dead horse’s eye that is crawling with flies. Within the horse’s eyes the reflection of the photographer can be seen—the close up of the eye is important in alluding to the idea that reality is not always perceived clearly through the eyes. Another subtle element of the film that becomes apparent is the lack of emotion and facial expression amongst the soldiers. As Carmi fires at the Mercedes with his platoon, his is emotionless and seems to be removed from the situation entirely. As Folman is firing from his tank he exhibits the same emotionless qualities. This forces the audience to question whether each individual is even present during the course of war—perhaps this lack of involvement and psychological distancing results in the wild amnesia that distorts the memories of veterans. 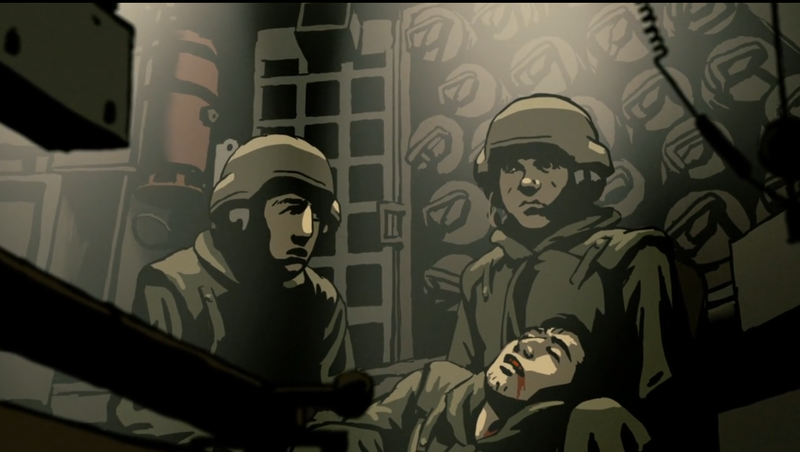 When Ronny Dayag recounts his memories of the war and the death of his commanding officer, there is a reaction shot that exhibits the same emotionless and disconnect from the situation as Carmi and Folman exhibited. And in the case of Dayag, he admits that he stops visiting the graves of his fallen brothers. When questioned why, he responds quickly saying, “I wanted to forget…I didn’t want to remember.” This becomes the first time any individual strictly admits to wanting to forget the past. 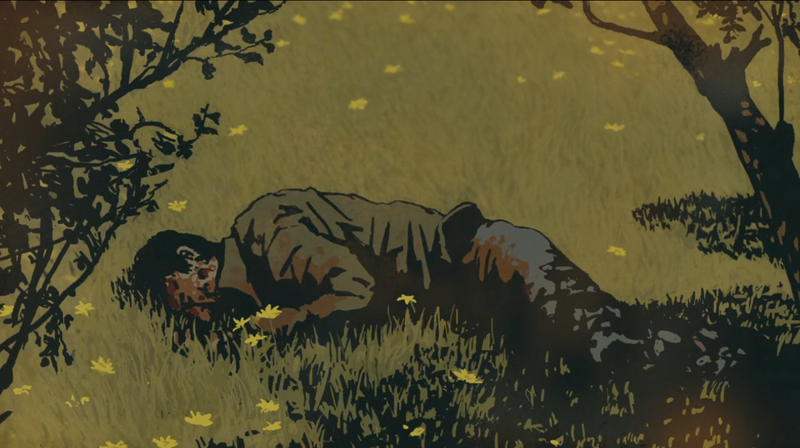 Immediately following Dayag’s confession, there is a shot of him standing on a hill below a tree overlooking his brothers’ graves. This shot is completely still, and the only movement that occurs is Dayag moving backwards and as he does so, the shadow from the leaves of the tree cover his upper body, concealing his identity. As he is moving backwards, he is still doing has a voiceover and he says, “I still feel guilty.” By having the shade cover his face, this shot is clearly displaying the shame and embarrassment he feels for being the sole survivor in his squadron of men. This shot is an extremely effect way of communicating the way Dayag feels because it has no pinpoint defined location in time. It could be in the immediate future or past, but the audience only knows it is recent because of the age Dayag looks. Without a precise pinpoint location in time, its effect is to inform the audience of an embarrassing and humbling consequence of war. Finally, the film approaches the concept of war in an honest and unique form—it doesn’t frame men in absolute bravery nor does it glorify the brotherhood of man. The film does the exact opposite. It shows that there are no protagonists in war and that the fear of death plagues the hearts of all men. 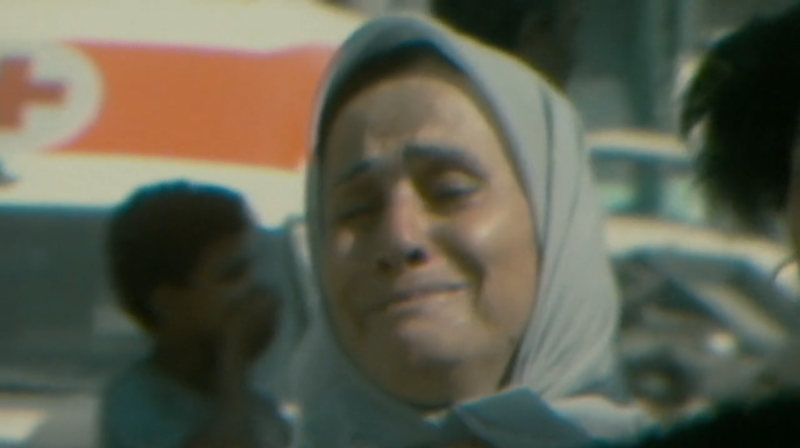 A number of scenes and shots highlight these unfortunate aspects of war. One of which is Carmi’s memory of immediately landing in Sidon and firing at anything that moved. 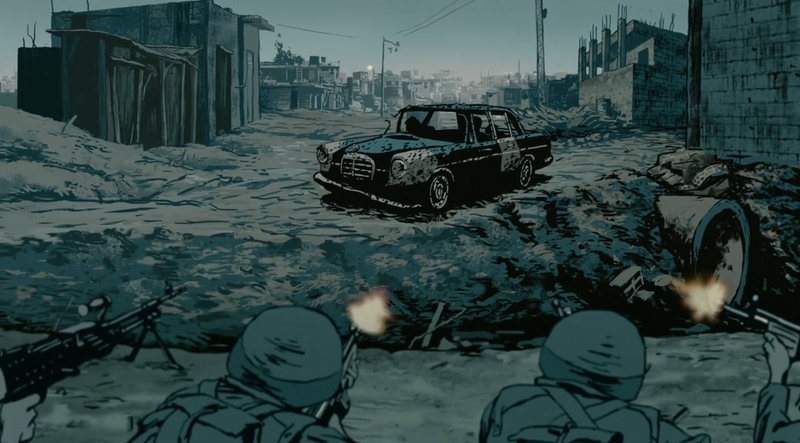 The shot from behind the line of soldiers uncontrollably firing at a Mercedes Benz illustrates the irrational fear that overtakes each individual. And the consequence of that fear is the death of innocent individuals—in the case of Carmi; it is the death of a family. 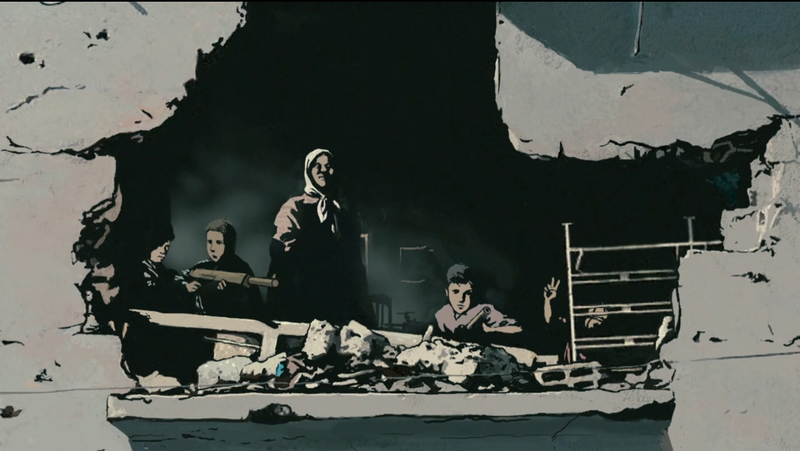 When Ori recommends Folman to piece together the memories of the refugee camp Waltz with Bashir by finding credible sources, the film takes a unique turn in presentation. 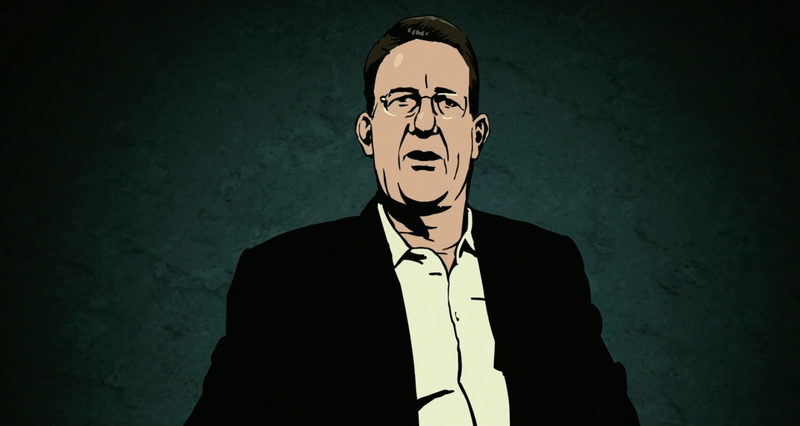 The film loses Folman as the narrator—it no longer is Folman’s story; rather it becomes a documentary of the Palestinian massacre. The audience is presented with scenes described and relived by credible sources of the war. The scenes are juxtaposed with interview shots of the sources explaining in person the details of the incident. 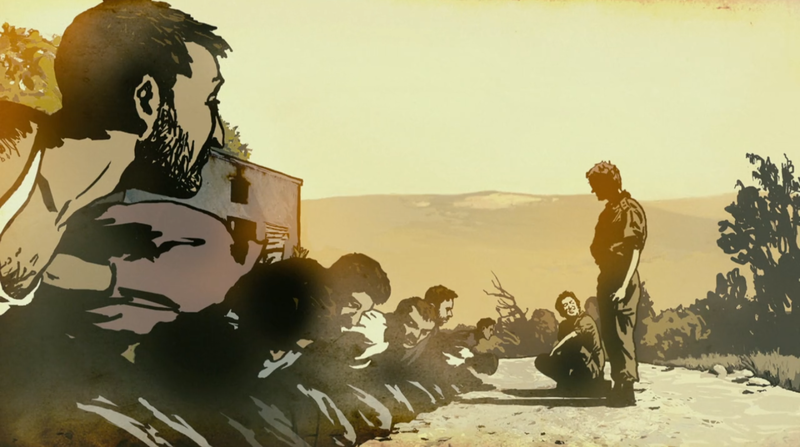 The last shot of animation in the film is a tracking shot where the camera moves past a group of women and children walking into the city and leads up to a close up shot of Folman’s face. This is a clear parallel to Folman’s hallucinations when the group of women and children rush past him. 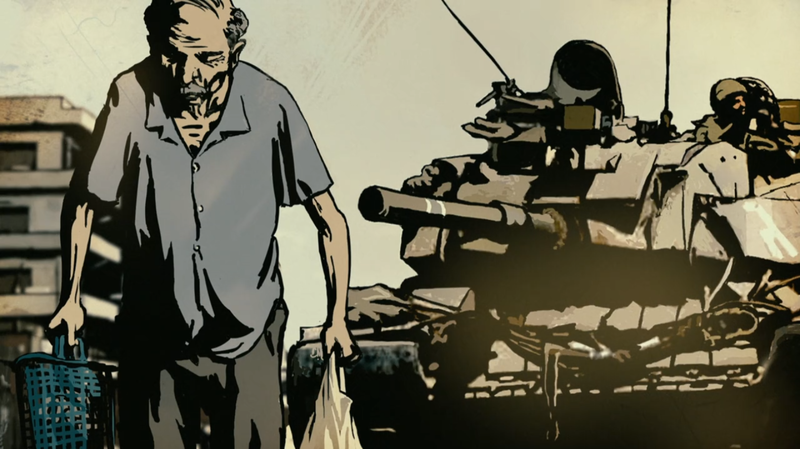 Additionally, it is an important moment in the film for Folman because it is at this point his participation in the massacre is confirmed by credible sources. If we examine Folman’s face as the last image of animation, it is also clear that he seems to be removed form the situation—owing to the idea that he was viewing the world from camera lenses rather than through his own eyes. 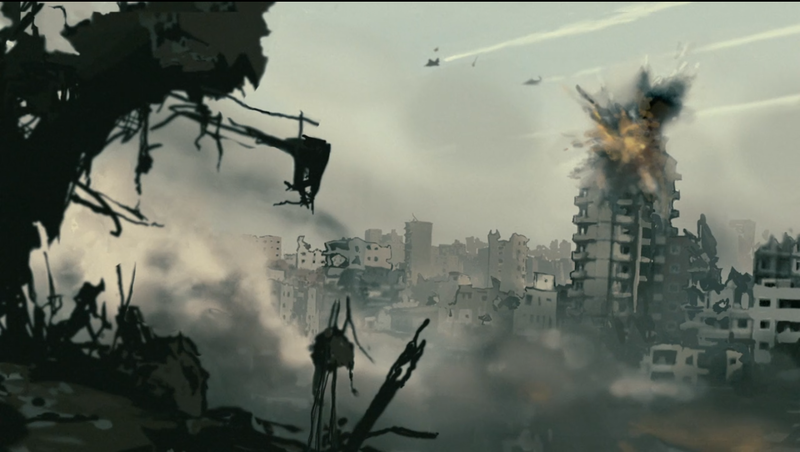 The last scene in the film is a transition from animation into filmed video footage of the aftermath of the Shatila massacre. This establishes that though the memories of the war may be forgotten or distorted, the massacre was a very real event. And the transition away from animation makes the scenes exponentially less attractive and more disturbing. 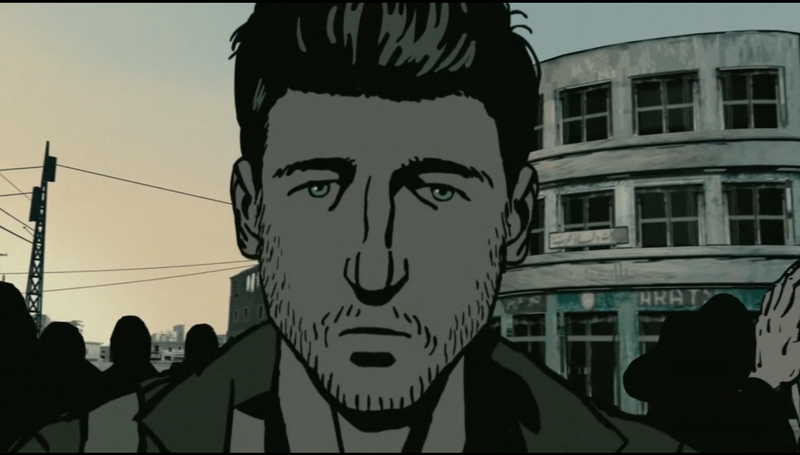 From the conversion of medium, the parallels between reality and animation are clear. 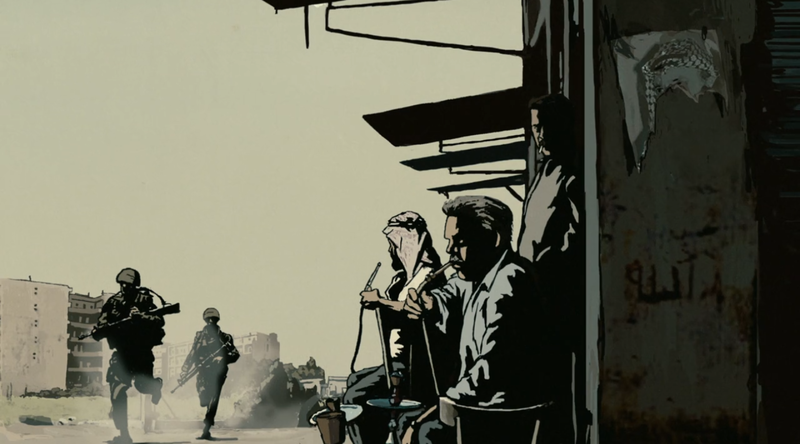 Folman uses animation as a tool to showcase how the viewer can escape the brutalities of reality, and the transition into camera footage makes reality unbearably difficult to look at and to remember.